The All Party Parliamentary Food and Health Forum (FHF) is an all-party independent forum for the exchange of views and information on food policy in the UK Parliament. Our objectives are to stimulate well-informed debate as a result of a greater awareness of food policy's significance and to explore and contribute to knowledge, policies and information on food policy, diet and health. The Forum's main work covers the relationship between food, nutrition, health and the implications of these factors in key areas affecting health in the population. The Forum has both Parliamentary and Associate (non-Parliamentary) members including a wide range of representatives from the food industry and other organisations with an interest in food and health issues, whose membership subscriptions fund the services provided by the Forum. We are also grateful to our Core Supporter, Danone UK, for its financial assistance. 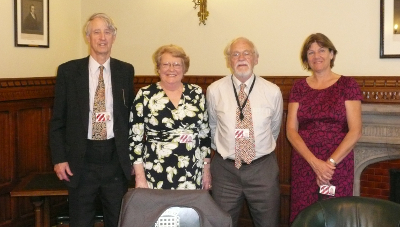 During 2009 the Forum took part in a joint Parliamentary inquiry into food security with the Parliamentary Scientific Committee and the All Party Parliamentary Group on Agriculture and Food for Development. The inquiry was chaired by our former Vice-Chairman, Dr Ian Gibson MP, the former Chairman of the APPG Agriculture and Food for Development. FHF Officers on the inquiry team included: Lord Rea, Baroness Gibson of Market Rasen and Baroness Miller of Chilthorne Domer. The inquiry team published their report in January 2010. Full details can be found on our inquiries page. The Food and Health Forum held an inquiry during 2007 which considered the links between diet and behaviour. The inquiry report and a press release are now available from the inquiry page. Members of the forum include MPs, Peers, Academics, Food and Health Industry Specialists, Food Research Organisations, Charities and Commercial Food and Health Organisations. We hold meetings of the forum every four to six weeks whilst parliament is sitting. Reports of the meetings are sent to all members, and Newsletters keeping members abreast of relevant issues and policy developments are sent out every month when Parliament is sitting.